A Pinot Noir led sparkling wine, Chandon Brut Rosé celebrates the high quality Pinot Noir vineyards of our corner of Australia alongside the complexity deriving from our French heritage and the méthode traditionnelle. A striking rose petal pink hue of medium intensity with delicate bead and persistent mousse. Aromas of fresh strawberries, pomegranate and cherry Danish are overlaid by a complex bouquet drawing from ageing on yeast lees. Subtle wild mushroom and savoury elements sit in the background. The palate is refreshing with layers of redcurrant, cherry sorbet and pink grapefruit zest alongside hazelnut and biscuit flavours. 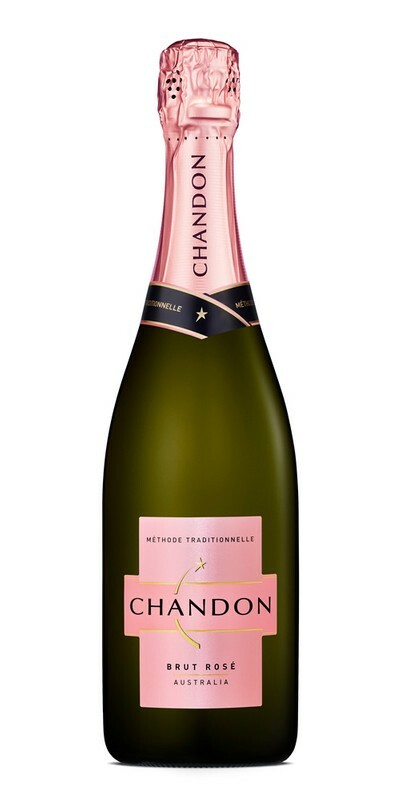 Chandon Brut Rosé is delightfully dry, with a creamy texture and persistent acidity. The complexity of Chandon Brut Rosé derives from blending base wines from a diverse collection of vineyards at varying altitudes, aspects and vine age. The most significant regions for this blend were the Yarra Valley, Strathbogie Ranges and the King Valley, where Pinot Noir thrives in the cool, elevated vineyards. The average yield is between 10 and 12 tonnes per hectare. Vineyards are trained to the standard vertical shoot positioning trellis to improve sunlight penetration and permit airflow within the canopy in order to optimise the vibrant flavours in the grapes. Chardonnay and Pinot Noir grapes are harvested from early February to late March. On arrival, grapes are pressed to juice, which is then briefly held before a light clarification step prior to inoculation with cultured yeast. Approximately 6% of the blend is selected from Pinot Noir to ferment briefly as whole must, without pressing, to produce a highly coloured base wine. In May, the winemaking team assemble the Chandon Brut Rosé base from this selection of new base wines, coloured base wine and reserve wines from previous years. The aim is to produce a blend with consistent style, complexity and character. All three classic Champenoise varieties are used and while the blend may vary from year to year, Pinot Noir usually accounts for around 60% of the final composition. Colour base wines contribute to the delightful pink colour, and normally comprise around 6% of the blend. The reserve wines are stored in a combination of large oak barrels, barriques and stainless steel and comprise no more than 20% of the final blend, adding maturity and further complexity to the Chandon Brut Rosé style. Following the secondary fermentation in the bottle the wine has extended ageing on the yeast lees, which contributes a range of complex, savoury characteristics to the finished wine. Perhaps more importantly, the yeast contributes to the texture and overall finesse of the bubbles in Chandon Brut Rosé, a result which cannot be achieved without this méthode traditionnelle. Individual bottles are then riddled and disgorged, and a small amount of dosage liqueur is added to finish the wine. After a further three months bottle age the wine is ready for consumption.